The Portfolio provides an opportunity for NCP members to develop their photographic skills and techniques. It is usually offered every 2 years, 2017 being the most recent. This is not like the Club’s monthly competitions, where awards are given. It is in fact the antithesis of this process. 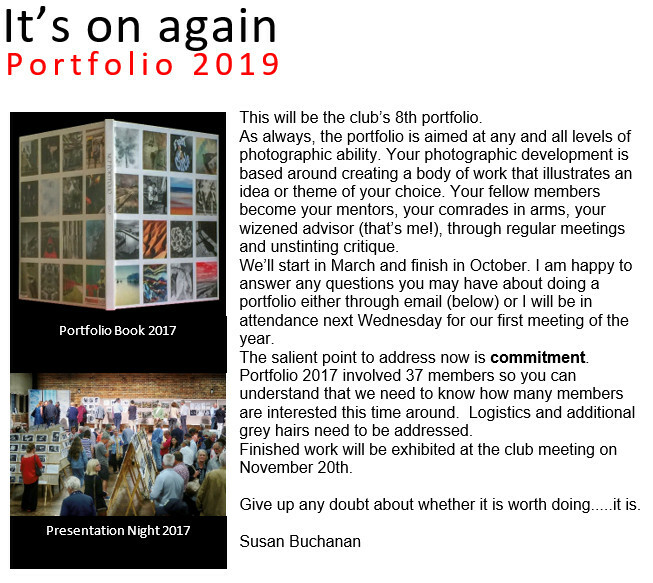 This is an opportunity for members to take on a project, develop their own theme and to receive feedback from fellow club members as their portfolio is being developed. It is suitable for every level of photographer from beginner to advanced, as long as they bring their best efforts to it. Meetings are usually held once each month from around April to October and are coordinated by the Portfolio Leader, who will also provide guidance and advice. At the meetings, each participant displays their work at whatever stage it is, and presents their ideas for its further development. The rest of the group offers opinions, suggestions, feedback. This feedback is the mainstay of the process and previous participants have been generous in their praise of the how this camaraderie infused their positive outcomes. Completed portfolios are exhibited to the club at Portfolio Night in November, which is always a wonderful evening. Doing a portfolio is a challenging but most rewarding experience. So before you decide to do one, be warned: it is a very demanding process with the rewards gained commensurate with the effort expended. The first step is to express interest and perhaps some initial ideas to the Portfolio Leader, who will let you know the schedule of meetings. This is an opportunity to move away from your “safe” zone and try something new. Think about developing your skills in another area e.g. still life, social documentary, portraiture, macro, computer manipulation. Keep in mind that the idea is the important element – developing technical skills should support and not overshadow this. Any print photographs can be included, with no restriction on size or technique. The number of images should suit the topic/idea. Choose your topic carefully and stick with it. As your portfolio develops, constantly ask yourself – do the images fit the theme? Consider how you want to photographically develop your portfolio. Be consistent with the images in your portfolio so they show some cohesion. If there is a possibility that you may frame your photographs for display, then make the size of prints and mats consistent throughout your portfolio so they are all ready for framing. Plan your approach: will it be a story, or a sequence? Will it be educational, aesthetic? Will it contain text? If you need to get permission to photograph (e.g. in the kitchens of fine restaurants), prepare a letter introducing yourself as a photographer and describing the project. Recognise that every image must evoke an emotional response – not ONLY from you, from your audience as well! Determine what it is that you want to achieve – shock, beauty, social statement? Above all – be creative !!! Keep in mind that any or all of the above suggestions could and maybe should be overturned during discussion of YOUR portfolio.